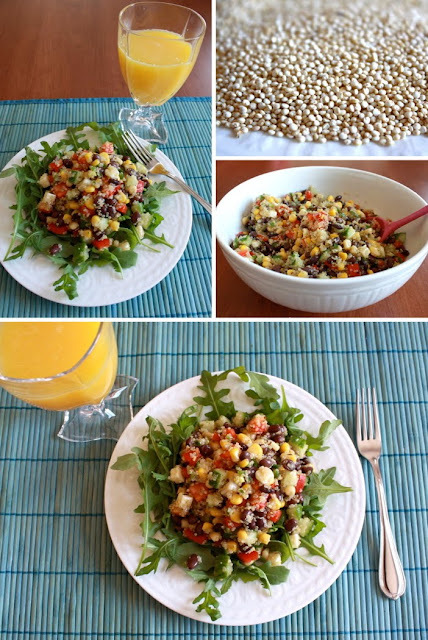 I love making this salad because it's easy and healthy, and of course it's super tasty too! optional: cubed cheese pieces, avocado pieces, liberal amounts of fresh coriander... or anything else you may think of. 1. Cook the quinoa as directed on the package. I do it the lazy way, and boil it in water for about 15minutes (until soft) and then simply strain out the excess water. 2. Mix all ingredients in a large bowl, and then poor in the dressing. If you follow the recipe for my dressing, it will likely make more than you need for the salad... so add it to taste.